I watched Brett Anderson carve up the Mariner offense (granted, one missing both Ichiro and Adrian Beltre) last night and was highly impressed, as is getting to be routine. If you watch this 21-year-old throw and don’t come away thinking that the A’s have found their future ace, you’re in the minority. Anderson is opening eyes every time he takes the hill. The interesting thing about last night, though, is how much better his stuff was than the first time I saw him pitch this year. On April 10th, he gave up five runs in seven innings against the Mariners, only notching two strikeouts, while his fastball topped out at 93 and his breaking ball was in the low-80s. It was his major league debut, but the stuff was less than what had been reported in the minors. Last night, it was better than I had heard coming into the year. Up to 97 with the fastball and a mid-80s hard breaking ball that no one could touch made him look utterly dominating. 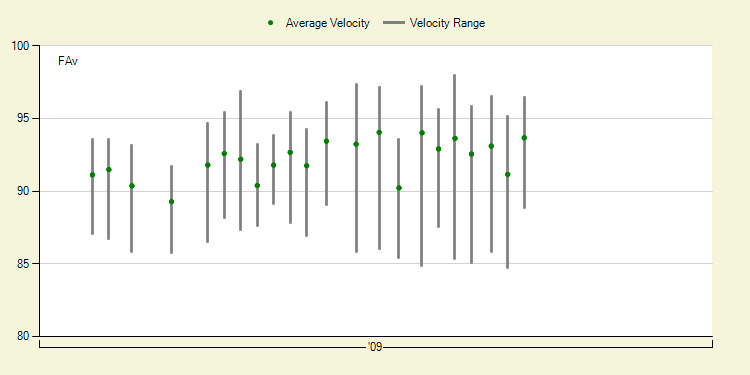 It wasn’t a one night fluke, either – here’s Anderson’s velocity chart for the season. Whether the reason, Anderson didn’t leave spring training with his best stuff. His first six starts, he managed just 31 innings, gave up 28 runs, walked 10, and struck out 15. The stuff was just okay, the command wasn’t great, and he just didn’t look like a premier young pitcher. 18 starts, 109 innings, 49 runs, 29 walks, 102 strikeouts, 12 HR, 3.61 FIP. That’s an impressive run for any pitcher, much less a 21-year-old rookie who had all of six starts at Double-A coming into the season. And, with the stuff taking a significant step forward, there’s a real reason for the improvement. His overall season line might not blow you away, but for the last three months, Anderson has been one of the best pitchers in baseball. I have a feeling we’re going to be saying that about him for a long, long time. This kid is good. We hoped you liked reading Anderson’s Step Forward by Dave Cameron! If you got to make a starting rotation this offseason made up of nothing but AL West pitchers and prospects that had to last you the next 2-3 years, who would you pick? Let’s say you get to pick 5 and maybe an optional 6th. I know this was meant for Dave, but I’ll give it a shot. With Andrew Bailey, Michael Wuertz, Brad Ziegler, David Aardsma, Frankie Francisco, and Jose Arredondo out of the pen. I’d want Lackey somewhere, too. Considering the 3-year window, I don’t think you’d want to go too prospect heavy anyway. How about this? I’m not sure how this hypothetical works, but if we’re allowed to include free agent-to-be John Lackey, he slots in at #3. I don’t know enough about Bedard’s health going forward, but there’s no question he’s one of the top starters in the AL West when he’s right. Braden’s K rate is a bit troubling though….